I only think one thing when May’s over: Summer. I’m all about warm weather. If it’s below 70 degrees, I’m cold. As in, I’m wearing a coat. So obviously, we’re entering my favorite time of year. 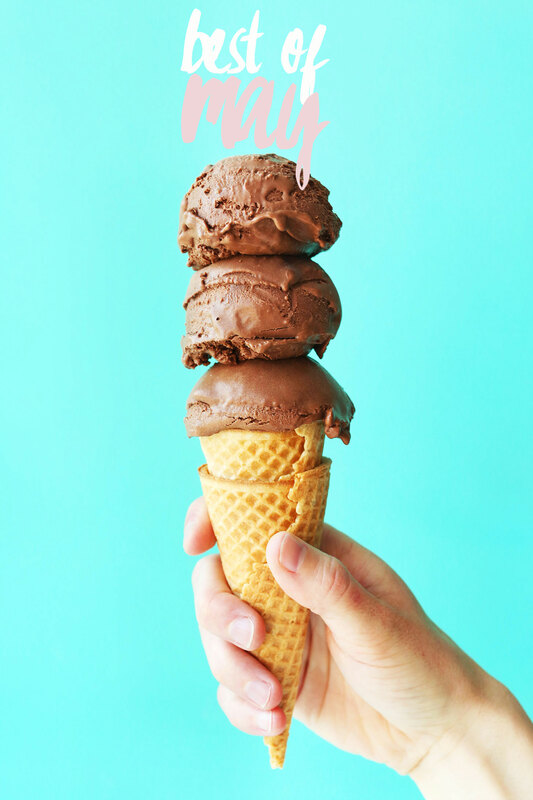 Plus, it means shorts, happy hours, margaritas, ice cream, tacos on patios, getting a sunburn on your forehead – all the best things in life. Before we jump into June, let’s recap May. It was a good month for us! 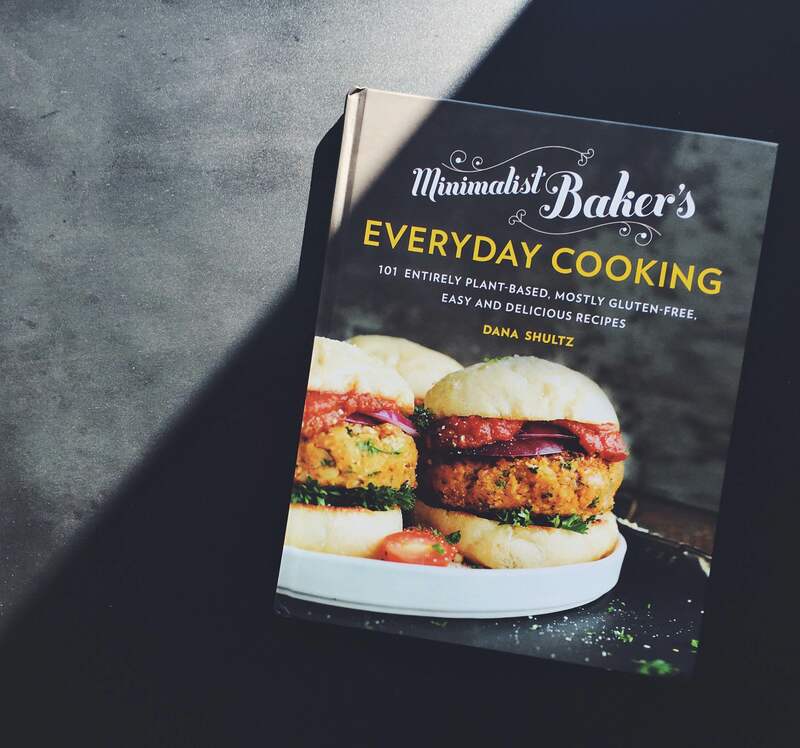 Our cookbook is 1 month old! Ahhhhh, so cute. And we have much more to talk about. Let’s get started with eats! May was kinda delicious. What was your favorite? I have a thing for the Rhubarb Bars and Thai Noodle Bowls! So good. At the end of April we released our first print cookbook! Since then you’ve left some awesome reviews and shared amazing photos of recipes you’ve made. Thank you so much for the love and support! Here’s a round-up of a few articles, interviews, and recipes featured from the book. Well + Good featured the book and shared THREE recipes! Go check them out! Table Manners wrote a lovely review of the book and shared the enchiladas and Butternut Squash Mac ‘n’ Cheese! A Q&A with Portland Monthly and the Best Vegan Enchiladas. An interview with The Washington Post! Veg Kitchen shared our Savory Eggless Benedict. Connoisseurus Veg shared our Cashew Soba Noodle Salad. Anna made our BBQ Veggie Burgers! Design Sponge featured our Dark Chocolate Almond Coconut Bites. Food 52 featured our go-to Coconut Whipped Cream method! Laura featured our Thai Baked Sweet Potatoes (serious yum). Brittany shared our Southwest Sweet Potato Black Bean Dip. Ali shared our Best Vegan Enchiladas. Kate shared our Vegan Bruschetta. Oh My Veggies shared our Spicy Braised Tofu Tostadas. Dolly and Oatmeal featured our Vegan Gluten Free Vanilla Cupcakes! Erin has already made and raved about our Blackberry Custard Pie and Spinach and Artichoke Dip! If you’ve bought the book and tried some of the recipes, let us know what you think! It really helps us out if you go and leave a review on Amazon! 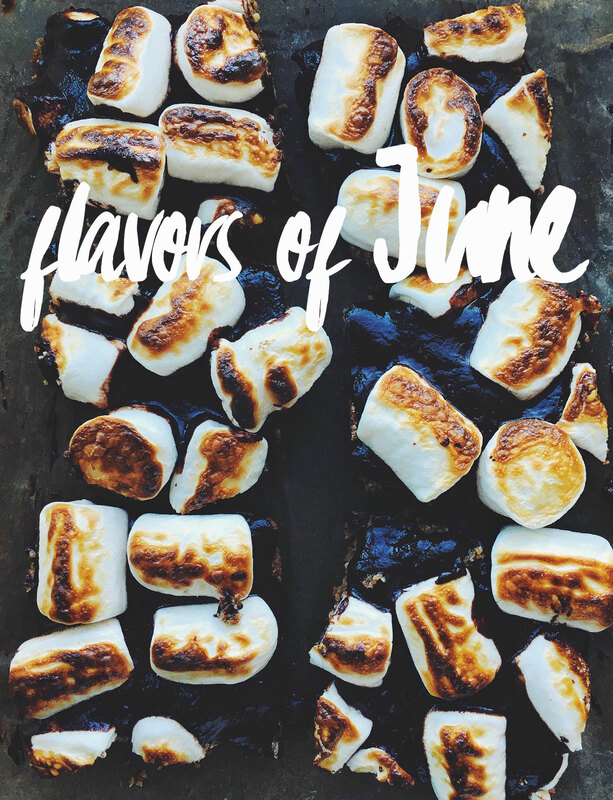 In June I’m obviously craving s’mores, so stay tuned for that and plenty of healthier, plant-based eats. Cheers, friends! Do you use a certain website or design to make the graphic of all your recipes with the circles? I love the look of it! See more about our web design and templates on Blogger Resources! We harvest a goodly portion of our basil in one go and make lots of pesto and freeze it in ice-cube trays, then bag and tag, and we’re good to go for the rest of the year. I MUST MUST MUST try the almond butter tofu and brown rice sushi! I loved this month so much! Ah! How exciting. Well I hope everyone loves them! I must say that the piña colada popsicles and almond butter tofu (LOVE the cornstarch technique) were my favs this month. That said, I am super excited to try the taco quinoa-meat. I love this series! It is beautifully designed and layed out – it looks like a Bon Appetite article. Obsessed! I am still on a only Minimalist Baker for lunch diet. Your cookbook has spoilt me, I’ll never be able to go back to plain rice and veg !